Well, it's taken a week to write this, so I'm just going to hit a few of my Oscar highlights. 1st - I was derelict in my duties and never did get a chance to see Milk or Slumdog Millionaire before the big night. I wish I could have truly been feeling these wins, especially since it was the year of the Slumdog. 2nd -I really think the presentation of past winners welcoming the new winners into the circle was inspired. Particularly, "the jackpot effect"; first you saw all the past winners of that category in clips, and it was unclear which of them would actually be present. Then, as the past winners would emerge into a synergistic semi-circle, we were swept away by the sheer presence of all that Hollywood Royalty! If they do this again next year, the presenters should look to Shirley MacLaine for pointers in addressing the nominated actor/actress. When she spoke to Anne Hathaway, it was not read from a prompter, she spoke to her from her heart, and truly passed the torch. 3rd - Hugh Jackman is truly versatile, I'm always amazed that he embodies Wo lverine's brooding outcast persona, can be as Broadway as Joel Grey, and is a great choice for People's Sexiest Man Alive! 4th - I've been in love with Robert Downey Jr., since forever, even during his years of crazy self-destructive misery. But he looked so GD good at the Oscars, it physically hurts to know he'll never be mine. It was as if he had a colonic, a detox, sat on a mountain top meditating and found the fountain of youth, all before arriving on the red carpet. 5th - Best acceptance speech came from Resul Pookutty, winner for Sound Mixing for Slumdog : "... I share the stage with two magicians, who created the very ordinary sounds of Bombay, the cacophony of Bombay, into a soul-stirring, artful resonance called Slumdog Millionaire. I come from a country and a civilization that given the universal word. That word is preceded by silence, followed by more silence. That word is "Om." So I dedicate this award to my country. Thank you, Academy, this is not just a sound award, this is history being handed over to me. My sincere and deepest gratitude to my teachers, Danny Boyle, Christian Colson, Paul Ritchie, Pravesh... and everybody who has contributed to this film. As far as best and worst dress is concerned -No catastrophes in the dress department stood out for me. 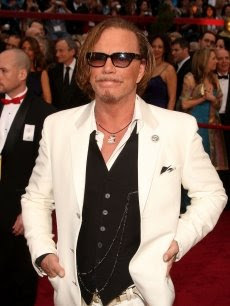 I even have to give props to Micky Rourke's choice of duds avec Loki pendant. I think others have been too hard on Miley Cyrus's gown which was far more age appropriate than her Golden Globe choice. But my choice for best dressed has to go to Taraji P. Henson - her hair looked like you wished your hair would look after you pay $100 for a relaxer and cut, her Roberto Cavalli dress was both fierce and old Hollywood. Oh, my other favorite part of the Oscars came during the red carpet, when Brad, just gave like a half smile and half a word to Ryan Seacrest and kept rolling. And even suave, dignified, Tim Gunn tried to fawn all over the super couple, but Brad & Angie stop for no one.